Go out the day before you pull and take the supers off then put them back on. This breaks any honey loose in any attached burr comb. The bees will clean up the honey that is dripping. The next day the supers won't be dripping all over the place when they are removed.. I made some little pallets the same dimensions of a honey super. Two boards on the bottom edges lifts up the pallet. I then move the supers around with a two wheeler. This helps save the back. Have a small sheet or towel to cover any open honey boxes to prevent robbing. If using honey robber and a fume board, plan to pull on a 85+ degree day. The warmer it is the better it works. Bee escapes work, but remember to close all cracks and crevices that a bee could fit through on the supers. If this is not done bees will rob the honey from the supers. When you come back to pull, they will be empty. I will be prepared to put on ApiGuard mite treatment as soon as the supers come off, saving a trip back. When you take the honey off, put it in a room with a dehumidifier running. This can help lower the moisture content of the honey before it is extracted. The room also will warm up, this helps warm the honey for easier extracting. Make sure you do not have hive beetle, if you leave supers without bees in them. They can make a mess of things. Before extracting, put down cardboard on the floor. This makes clean up a breeze and could possibly prevent a divorce. When you have finished extracting have the honey moisture checked. This will make sure it is US Grade A or not. How many bottles? A medium super when full has about 35 - 40 pounds of honey in it. A deep hive body has about 85 - 90 lbs of honey. Using this as a guide the number of containers can be estimated. A hive with four full supers will be about 160 lbs of honey. Containers can be purchased with this number in mind. Remember all honey granulates. Is the honey in a container that you will be able to liquefy? It is easier to liquefy a 1 lb jar in a crock pot water bath on low than a 5 gallon pail with 60 lbs of rock hard honey. We all produce honey. The important thing to realize is honey has to be the proper moisture content. U.S. Grade A honey has to taste like honey and have a moisture level of 18.6% and below. Moisture levels above this threshold will ferment and is not considered honey. To test the honey I use a refractometer. This instrument takes a small amount of honey placed on a glass lens. Holding the instrument to your eye, a scale is visible. Reading the scale, then take it away from the eye. On the bottom of this type of refractometer is a thermometer. The thermometer has a scale to adjust for temperature change that affects the viscosity of the honey. By adding or subtracting this scale, will give the proper moisture content. There are many refractometers out there. Beekeepers use the ones that specify for honey. Prices range from about $75 - $350. If someone wants their honey tested I will do this for free. To bring a small sample to be tested, the container should be full. 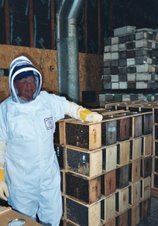 A partially filled sample container will absorb any moisuture in the container and not reflect accurately of what the honey moisture truly is.